Room 1 has a queen size bed with 1 single bed, room 2 has three single beds. All beds have electric blankets and doona’s. Open kitchen with gas oven, microwave and dishwasher. Dining and lounge area has slow combustion wood heater. All cottages have TV with DVD/Video players. Happy Valley is a long established rural property with the owner operators living on site. The accommodation is guaranteed to be clean, warm and comfortable and our aim is to make guests so enjoy their stay they will want to come again. 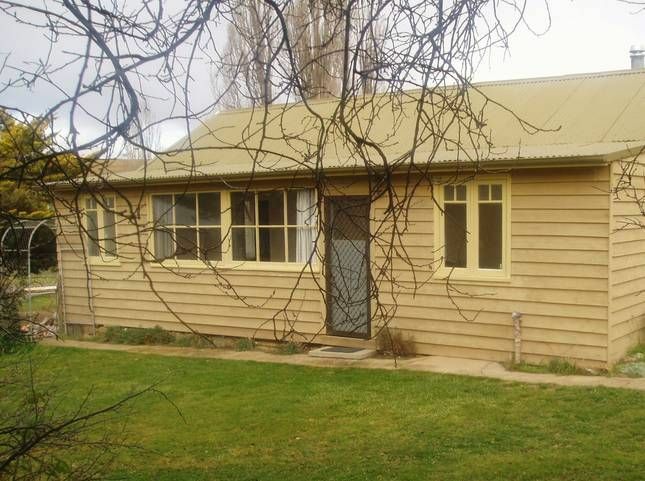 Happy Valley is in a secluded location five minutes from Adaminaby and approx. forty five minutes from Mt. Selwyn snowfields. Coming from Cooma on the Snowy Mountains Highway, when within 2kms of Adaminaby & have just passed the Golf Course on your left, you will come to the cross roads. Turn left into Bushrangers Hill Road, drive along this for approx & then you will come to "Happy Valley" which is the first property on your left. Follow the road past the gate to the main homestead and Mary's Cottage. Now, what do you do once you get here? In winter enjoy skiing at nearby Mt. Selwyn Snowfields, a friendly fun place for the whole family located approx. 45 minutes drive from Happy Valley. Ski and chain hire. Tell the friendly staff at the Adaminaby NRMA Ampol Ski Hire that you are staying at Happy Valley and they will give you 10% discount on your skis and equipment and 10% discount on your chain hire. Please note. It is compulsory for all two wheel drive vehicles travelling on Snowy Mtns. roads in winter to carry chains. The Adaminaby general store, post office and news agency have a great range of newspapers, magazines and other reading material. They also have a good range of supplies and other holiday needs. If you wish to eat out there are two cafe's in the town and restaurants at the Bowling Club and the Hotel. We enjoy our stay ,it was secluded and quiet . Plenty of space. This was the best laid back, low-tech, break we've had in a long time. The photos in the listing didn't really do the cabin or its setting any justice as it turned out to be exactly what we were looking for. The wood burning stove was more than enough to keep it warm all evening and into the night and the BBQ outside was great fun to use in the evening under the stars. Happy Valley was a charming place with kangaroos jumping across the property. The fire place in Mary's Cottage kept us warm and cozy and we had a good time!The owners could have done more out of the cottage as it has a charming lay out. The cabin has most essentials but we would recommend the purchase of a wooden spoon and a couple of small cutting knives. It would also be good to repair the window in the smaller bedroom so that it can be closed.